@Evangeline Check out Hendrix's "House Burning Down" and crank it up! I've heard the song, but only through crappy headphones. It'll be cool to blast it. I am you as you are you as you are you and you are all together. I looked the company up, it's a corporation that makes bootleg records. When I looked at the list of records they had reproduced, Mine wasn't on there and I haven't found out anything about it. I have yet to listen to it. OMG - Great album! The type of record you might want with you on the proverbial desert island. Half the songs are classics. I own the original album. It's really awesome. I love it more than his Tea For The Tillerman album. Let's hope it's not a pirate of the original album, rather than a bootleg. Still, if it does turn out to be a pirate, 27cents ain't too much of a loss. Is there a big difference between pirate and bootleg records? I assumed they were the same, also picture of a description of the company I found. There is a difference, @Evangeline, and quite a big difference. Pirate labels would/do produce fakes of officially released material, cheaply pressed and without the production values of the official release, selling it below the price of the official product to attract buyers. Bootleg labels, meanwhile, concentrate on officially unreleased studio or live material. In this instance if, when you get to hear it, it is a straight copy of the official album, then it's a pirate, but if it contains alternate studio takes or live versions of the songs then it is a bootleg. Some pretty groovy artwork on that sleeve, if I may say so! A slight update to this: according to this excellent guide, there were just 250 demo discs made of Love Me Do , making it one of the rarest Beatles records made. One sold for £8,500 on eBay in 2013, another for £11,100 in 2011, another (in worse condition) for just £1,950 the same year. Made for both radio and for the record shops, all U.K. Parlophone and Apple 7" Beatles singles had promotional Records. A Promo is always a copy of the exact performance and mix that is to be sold in the record shops. 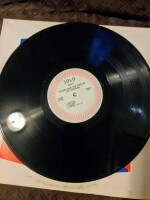 It is pressed from the very same plates used to make the commercially-available 45rpm singles. The first 12 Beatles singles, from "Love Me Do " trough "Paperback Writer "(*) all had promo's on white-label disks with black ink and, on the Aside, a large red "A"over the face of the label. 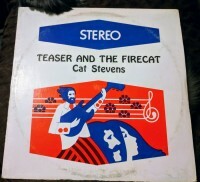 Records like "Day Tripper /We Can Work It Out ", issued as double-A-sided disks, had the red "A" on both sides of the record label. * excepted for "She Loves You , Can't Buy Me Love , I Feel Fine , and Help !" EMI did not prepare a demonstration record for these records. Beginning with "All You Need Is Love (**)", Promo's were made with a lime-green background and a White "A" on the intended Aside. These lime -green promo's had slightly-smaller labels, so the labels fit within the circle of ridges surrounding the label area, instead of overlapping onto them, as the previous promo's did. ** EMI did not prepare a demonstration record for "Strawberry Fields Forever "
Demo copies of EMI records were issued in "Top Pop" sleeves. Demo's from "Love Me Do " untill "A Hard Day's Night " would have featured a blue, yellow or red sleeve. I don't have figures for how many demos of subsequent Beatles singles were made, but I'd imagine it was many more than 250. I'm definitely going to keep looking for demo Beatles singles, although there are counterfeits out there. It seems it's quite easy to print off a label with a big red A on it and glue over a normal Parlophone one. Who'd have thought it? @Joe, got £4k hanging around in a bank account that you don't know what to do with? A Beatles record is expected to sell for more than £4,000 at auction. The sale comes after it was 'accidentally' donated to charity. The demo of the Liverpool band's debut single is one of only 250 that were originally made to be sent to radio stations. The Love Me Do single was donated it to a British Heart Foundation (BHF) store in Midhurst, West Sussex. 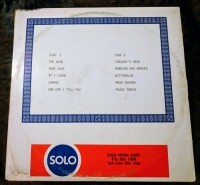 The original seven-inch demo comes complete with a misspelling of Paul McCartney 's surname, as "Lennon-McArtney" are credited. All money will go to charity.